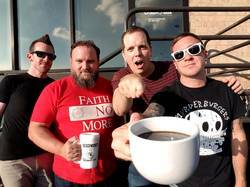 Coffee has a special place in pop-punk history, and it's at the forefront of the soon-to-release Death Defier by Washington DC's American Television. When the band released their new album on July 28, they will also be selling a signature roast coffee made in collaboration with DC's Weird Brothers Coffee. Pre-orders of both coffee and album are open now.